I get asked all the time what are you majoring in, what are your plans once you graduate, and what kind of career do you want? I used to tell them any other answer than the truth, because for a long time I had no idea what I wanted to do. I had no clue what I wanted in the future because it always seemed so far away. Now I am within a year of graduating Western Kentucky University with a degree in Anthropology and I can finally say the truth. I want to work in a museum, or archives setting, and that is exactly what I have been doing for the last few weeks. I have had the extraordinary privilege of interning in the WKU Archives. I cannot tell you how amazing it has been. My biggest project is the Parking Exhibit that we just put on display. You might not think parking would be a very fascinating and interesting subject to work on, but I have had an absolute blast working on it. At Western we take parking seriously. 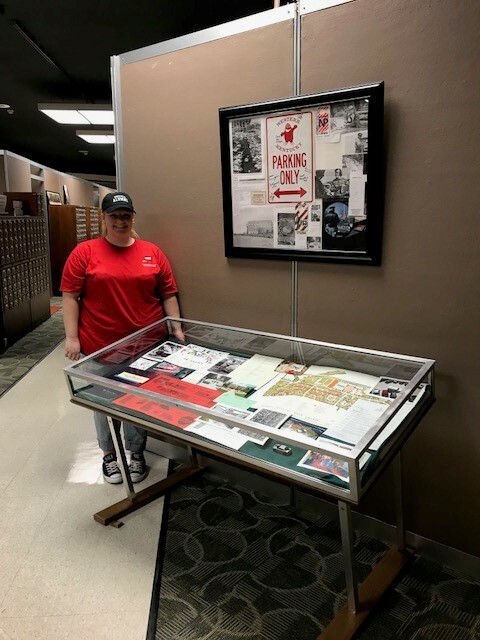 WKU has such an incredible history and I have enjoyed going back through time to find the perfect pieces for the exhibit. I wanted to showcase the past while bringing in the present. I think there is a good mix of then and now represented in the glass case and online. Our past is very important and it is something we can learn from and continue to grow, and not only here at WKU but anywhere. After doing this exhibit it has really opened my eyes to see how things have changed. Parking Structure 2 used to be just a confusing lot with a lot of arrows pointing in different ways. I learned that students aren’t the only ones with the parking problem, the faculty and staff have as hard a time as we do. That was not something I ever thought about before this exhibit. It was incredible to see how much I didn’t actually know about parking on campus. The oldest photo I found came from the mid 1930’s and it was taken in front of Van Meter Hall by Franklin Studio. I remember when I found that picture, it was amazing. The history that pictured represented and to be able to use it was an incredible feeling. The clothes, the cars, the people in the photo tells a story and I am so glad I get to share it will all of you. The College Heights Herald was a big help in this exhibit. From their photos to the commentary, and every once in a while a funny cartoon that expressed our dismay and resentment towards finding that one parking space. One of my favorite sequences of photos in this exhibit are pictures taken by Ricky Rogers in 1977. There are three photographs taken between 7:20 a.m. until 8: 00 A.m. in the old Diddle Lot that show the rapid filling of the lot with cars in that little amount of time. Which is still true to this day. The parking lots and structures fill so quickly early in the morning. Parking on campus is better than it used to be. Think of a campus with no parking structures at all, no transportation system, no zoned lots, and it doesn’t sound good does it? There is always room for improvement and change but that cannot happen overnight. Change comes gradually and in stages, which is what I hope is represented in this collection. I hope you can see the changes that have been made and hopefully see the possibility for future changes. After reading numerous letters, memos, emails, etc. I have learned there is no right way to fix the parking problem. There are solutions that can be done, but we just have to take them as they come. It could always be worse. There is so much more to tell, and I hope whoever is reading this will take the time to scroll through the online exhibit if you can’t see the exhibit in person. Though I highly recommend it. The exhibit will remain in the Special Collections Reading Room for two months then it will be moved to the main library for further display. I have worked hard on this exhibit to really show the accuracy and truth of the parking problem and I hope that shows in the collection. I hope you all enjoy taking a look through all the pictures, newspaper articles, letters, documents, maps, etc. I hope you find it as interesting as I have. I have learned so much from my supervisor Suellyn, she has been great. If I had to ask questions she never hesitated, and I did ask a lot of questions. This exhibit is the first one I have ever done, and I hope to do more. It has showed me so much, and I cannot think the Library Special Collections staff and my supervisors enough for all they have showed me. They helped me when I needed, but let me have the freedom to put this exhibit together my own way. They let me take control and tell the story, which was daunting because I wanted to tell it truthfully and accurately. 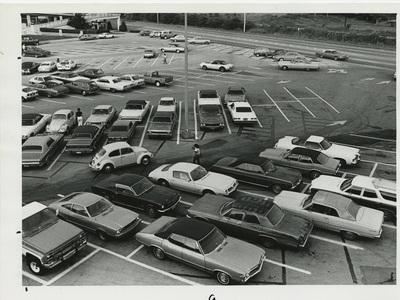 Each photograph in this collection tells a story, the students and people in them tell a story, the parking on campus tells a story, the growth of our campus tells a story and one that is still unfolding and will always be unfolding. This post written by WKU Archives intern Beth Sutherland. The exhibit will be on display in the Harrison-Baird Reading Room, 2nd floor of the Kentucky Building 9am – 4pm M-F through May 31, 2017.